As a country located in the equator belt, Malaysia is home to several great tropical sites great for your vacation. To make it better, most of the tourist magnets in Malaysia also have a good infrastructure, making visiting them usually a joyful experience. One of the most favorite tourist destination in Malaysia is a place known as Langkawi. Langkawi is an archipelago of 104 islands in the Andaman Sea, located on the northwestern side of Malaysia. The main island, named “Pulau Langkawi” unsurprisingly, is surrounded by the legendary beauty of Andaman Sea’s turquoise. In the main island, you will be greeted with an amazing panoramic view of a perfect mixture of paddy fields and jungle hills. As an island with World Geopark Status by UNESCO, Langkawi has several magnificently beautiful natural spots to show the world: Machincang Cambrian Geoforest Park, Kilim Karst Geoforest Park and Dayang Bunting Marble Geoforest park (Island of the Pregnant Maiden Lake). Any one of those three will give you a perfect place to feel the brutally seductive tropical rainforest of Malaysia. Both the landscape and wildlife will guaranteed to fascinate you, especially if you’re not from a tropical country. If you’re visiting, we recommend you to visit at least one of those three Geoparks. As an archipelago, Langkawi also provides a lot of excellent beaches and diving spots. There are a lot of unbelievably beautiful beaches here, for example the Cenang Beach (Pantai Cenang). The Cenang Beach is a portrayal of those surreal and dreamy beach artists love to draw, with a seemingly unending stretch of white sand and tall coconuts in the background. There are a lot of restaurants open here, specifically built for you to enjoy the amazing beach and watch the sunset there. Some other beaches worth visiting in Langkawi are Pantai Tengah, Pantai Kok, and the Datai Bay. The final attraction you can find in Langkawi is the Langkawi Cable Car, which takes visitors to the peak of Gunung Mat Chinchang. 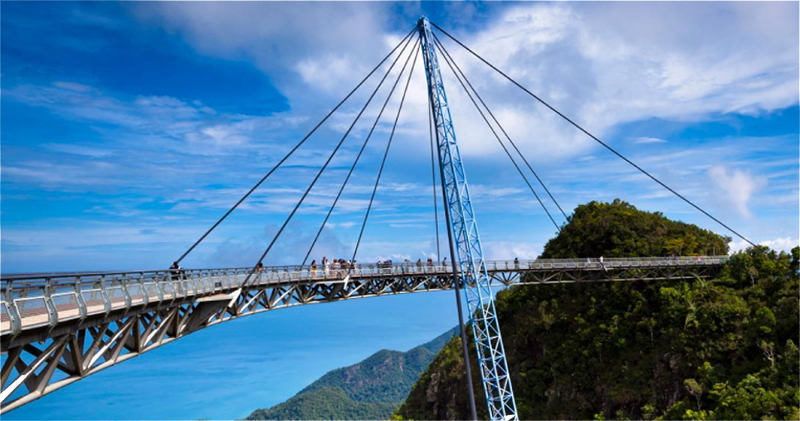 You can then meet the Langkawi Sky Bridge there, a huge Bridge located above the rainforest canopy. The panoramic view here is unreal, and could easily make you feel like you’re lost in a different planet. Unfortunately, the bridge was closed in 2012 for maintenance and upgrade, but it is scheduled for reopen in December 2014. If the descriptions of the attractions in Langkawi make you think that it is a secluded place, don’t worry. As a tourist magnet, Langkawi is easily reachable. You can get to Langkawi by air and by sea. The Langkawi International Airport is one of the 7 international airports in Malaysia, with a lot of flights in and out of Langkawi. Should you choose to travel by the sea, there’s the Langkawi Jetty Point that connects Langkawi to other places in Malaysia like Penang and Kuala Kedah. Upon arriving in Langkawi, the transportation in the island itself is commendable. There are a road that runs through the whole island, complemented by several taxi services to move you around. Transportation really should not be a problem when you’re here. Just like transportation, the accommodation in Langkawi is also great. There are a lot of Langkawi hotels you can stay at, from the cheapest one to the five stars hotel. For example, there’s a Resorts World Langkawi, an old hotel with great views and facilities like spa, beauty salon, and touring service. Another more modern alternative is the Meritus Pelangi Resort, a five stars accommodation featuring a long list of facilities like game room, barbeque, spa, library, massage service, Jacuzzi, car rental, and even play grounds. For another options of hotel, you can simply check Traveloka.com or Agoda. With all of those great Langkawi hotels, you won’t have to worry a lot on accommodation when visiting Langkawi. Thanks for sharing dear. Will take this as reference when I travelling to Langkawi. im going there next week :D gonna check them out! Long time didn't go to Langkawi already and it is still a very nice place to visit. wow...thank for sharing!! really wanna to plan to travel there!! Traveloka is a really nice travel planner guide! My family is planning a trip to Langkawi soon, hope I can able to join too! I am planning on going to Langkawi over the Long weekend and I am sure this will come in handy!! Langkawi is a great place. Thanks for the info. I am planning to visit. I have not been to Langkawi but seems to be a gorgeous place. nice post! thanks for the guide. will just share it with my foreign friend whenever they ask about Langkawi. LOL. The last time I stepped on the island of Langkawi was 2 decades ago - a lot has changed since then, I'm sure. I'm definitely due for another visit, soon. Thanks for sharing about the wonderful spots.